Admiral Karl L. Schultz assumed the duties as the 26th Commandant of the United States Coast Guard on June 1, 2018. He previously served from August 2016 to May 2018 as Commander, Atlantic Area where he was the operational commander for all Coast Guard missions spanning five Coast Guard Districts and 40 states. Previous operational assignments include Sector Commander in Miami, Florida, as well as command tours aboard Cutters VENTUROUS, ACACIA and FARALLON. His senior staff assignments include Chief of the Office of Congressional and Governmental Affairs; Congressional Liaison to the U.S. House of Representatives; Liaison Officer to the U.S. Department of State, Bureau for International Narcotics and Law Enforcement Affairs; Assignment Officer at the Coast Guard Personnel Command; and Command Duty Officer in the Seventh Coast Guard District Operations Center in Miami. 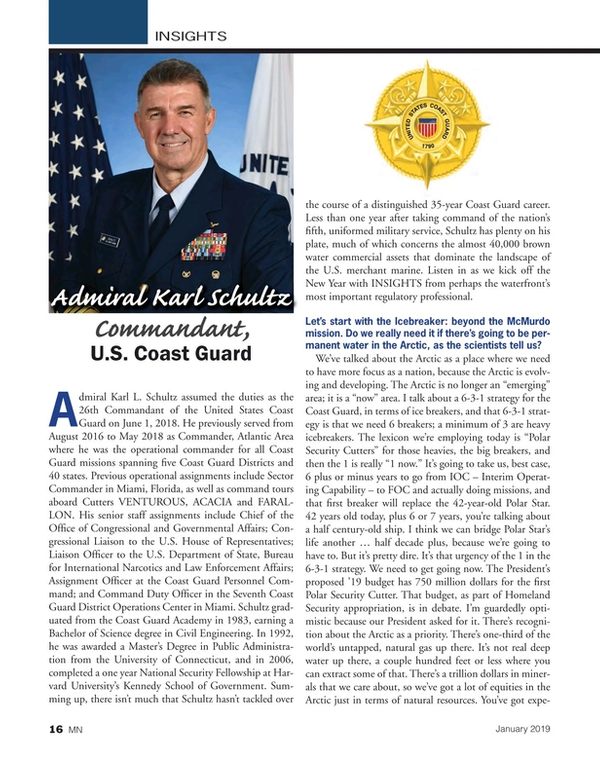 Schultz graduated from the Coast Guard Academy in 1983, earning a Bachelor of Science degree in Civil Engineering. In 1992, he was awarded a Master's Degree in Public Administration from the University of Connecticut, and in 2006, completed a one year National Security Fellowship at Harvard University's Kennedy School of Government. Summing up, there isn’t much that Schultz hasn’t tackled over the course of a distinguished 35-year Coast Guard career. Less than one year after taking command of the nation’s fifth, uniformed military service, Schultz has plenty on his plate, much of which concerns the almost 40,000 brown water commercial assets that dominate the landscape of the U.S. merchant marine. Listen in as we kick off the New Year with INSIGHTS from perhaps the waterfront’s most important regulatory professional. Let’s start with the Icebreaker: beyond the McMurdo mission. Do we really need it if there’s going to be permanent water in the Arctic, as the scientists tell us? We’ve talked about the Arctic as a place where we need to have more focus as a nation, because the Arctic is evolving and developing. The Arctic is no longer an “emerging” area; it is a “now” area. I talk about a 6-3-1 strategy for the Coast Guard, in terms of ice breakers, and that 6-3-1 strategy is that we need 6 breakers; a minimum of 3 are heavy icebreakers. The lexicon we’re employing today is “Polar Security Cutters” for those heavies, the big breakers, and then the 1 is really “1 now.” It’s going to take us, best case, 6 plus or minus years to go from IOC – Interim Operating Capability – to FOC and actually doing missions, and that first breaker will replace the 42-year-old Polar Star. 42 years old today, plus 6 or 7 years, you’re talking about a half century-old ship. I think we can bridge Polar Star’s life another … half decade plus, because we’re going to have to. But it’s pretty dire. It’s that urgency of the 1 in the 6-3-1 strategy. We need to get going now. The President’s proposed ’19 budget has 750 million dollars for the first Polar Security Cutter. That budget, as part of Homeland Security appropriation, is in debate. I’m guardedly optimistic because our President asked for it. There’s recognition about the Arctic as a priority. There’s one-third of the world’s untapped, natural gas up there. It’s not real deep water up there, a couple hundred feet or less where you can extract some of that. There’s a trillion dollars in minerals that we care about, so we’ve got a lot of equities in the Arctic just in terms of natural resources. You’ve got expeditionary cruise vessels – the Crystal Serenity with 1,500 passengers has made excursions through the Arctic the last couple years. So where there’s activity, generally by default, there’s Coast Guard mission responsibility. I see the Arctic as very competitive. I see the Coast Guard as the face of U.S. presence up there. We’re 6, 7 years from that first Polar Security Cutter floating and doing missions, and arguably, that means missions in the Antarctic. We’re probably closer to 8, 10 years before we’re talking about presence in the Arctic, so we’ve got to get going, is my view. Head count for the Coast Guard has always been an issue. And, arguably the mission set has done nothing but increase in the last 10 years. Where are you now in terms of the people that you have, and in comparison to where you were 10 years ago. Do you have the head count that you need? Let me work it backwards. So from the 10 years ago to today, we’re about 3,000 less people than we were 10 years ago. My reserve ranks are down to 6,200 people, down from 7,900 reservists back 10 years ago. We have about 1,400 less active duty men and women today. And, I think we’re at about 8,500 civilians. But, we’re about 2900 bodies smaller today than we were a decade ago. My predecessor started us looking at a forced planning construct. We’ve done a ‘mission requirements’ analysis that Capitol Hill assigned to us. Admiral Zukunft talked about a 5,000 person increment would be about right for the Coast Guard. I’m trying to refine that – I don’t think that’s a bad number but if I’m going to argue on Capitol Hill for more dollars, amongst other needs, I need to put some fidelity in that. We’re doing some internal analysis on what the number is. Your statement about ‘there’s more work today than ever in the Coast Guard’ is absolutely true. I would say – good news/bad news story – we are more heavily subscribed than ever before, supporting our own department, supporting the combatant commanders, supporting the global maritime interest. As we field new assets, that’s where all our growth is coming. We’re really not getting a whole lot of bodies to fill other gaps … and, to put it in a budgetary context, I’ll walk it all the way back to the Budget Control Act of 2011, sequestration of 2013, we lost about 10 percent of purchasing power on the operating budget piece in the last 8, 9 years. And … the 2018 budget that was really the President’s first push into what he called, his Presidential, National Security Presidential Memo 1 about the Armed Forces – Restore the Armed Forces – that really didn’t cross the fence line over to Homeland Security – that was DOD specific. So there was about a 12 percent increase in operating funds for DOD services. We got about 4 percent in ’18. That’s not a shot at DOD – we just weren’t in that conversation. So we’ve been pulling forward a little bit of lost purchasing power and that’s right in the wheelhouse of your manpower conversation. A number of your predecessors have said the Coast Guard is “done doing more with less.” Yes? Yes. We’ve said that; I don’t know if we’ve lived that. So I’m cautious about saying, I’m not going to do more with less. Instead, I’m going to say we’re going to try to match what we do with the resources we have and then make the business case for more resources when the need is there. Subchapter M is a big can of worms. Are you happy with where you are right now with the SubM progress? The Coast Guard has been pushing industry toward the third party option. Some of that’s arguably because you don’t have the in-house assets to do it and perhaps the expertise that eroded after 9/11 isn’t quite back to where you need it. Give us your assessment. First and foremost, we’ve got Subchapter M regulation, so we need to bring the towing vessel community into the regulated, certificated world of work. In terms of progress, the implementation is over four years. To date, we’ve issued about 200, and I think the latest number I’ve heard is about 227 COI’s. We’ve done 40 in the last 30 days. Arguably, I need to do about 120 a month, so I would say I’m not sure we’re making good progress yet. I don’t generally use “happy” as a metric; I would say … it’s new. What we’ve done is we’ve invested a new division in our Commercial Vessel Compliance Office – so CVC 4, that’s a headquarters program with a new division that’s overlooking third party organizations. We’re updating our databases to be able to better track third party performance. We got a lot of guidance from the El Faro report, so we are still working in being responsive to that. I’d like to be further along, but I think we’ll catch up quickly. We’re building our capacity. As you get bodies, you tend to put them at your most pressing problem, so we’re figuring this out. I’m guardedly optimistic. Is this inherently Coast Guard-only kind of work? Safety management systems for the industry will be a good thing. I think we’re all going to get a little bit of that shared ownership and pick up the pace here collectively. We’re still going to serve folks that choose not to go the TPO route, so we’ll be in the certification business, but I think that’s the ‘sweet spot’ for us in terms of our capacity, and I think for the industry at large, that will serve the industry well. In terms of the third party options, SubM isn’t the first time this has been done. It started with IACS Class societies doing COIs and grew from there. In the past, the classification societies traditionally did one thing and the Coast Guard was doing another. Today, that function is almost totally in the hands of class, or TPO’s. Are you supervising it adequately? That’s a fair question. We absolutely have to make sure, from an institutional standpoint, that we do have that expertise. Some lessons learned from El Faro, the final action memo, reflected some light back on ourselves to say, “Hey, we’ve got to up our game in that. We must make sure we have the oversight of our training programs to oversee the third party organizations.” That CVC-4 division is absolutely to hold ourselves accountable. So we put some bodies in that immediately, we’re putting more bodies in there in ’19. We talked about investments – that’s a place we’re investing some bodies. I’d like to see us put dozens more bodies into the Marine Safety Program on my watch. A lot of competing choices, but I’m committed to the Marine Safety Program and TPO is a big part of that. We’re a common sense regulator, but as the industry gets increasingly complicated, I’ve got the ability to train to a certain level, but we’re competing for a finite pool of talent out there, too. Industry will pick off many of my Coast Guard men and women. I’ve got to be an employer of choice so I’ve got to figure out how do I keep him (or her) in and move them up the ladder. It’s all part of the same conversation. Let’s talk about aids to navigation. As the Coast Guard turned physical aids into virtual ATONs, a worry on inland waterways was the physical loss of the buoys. More specifically, some thought it was a function of budget, but that’s not really true, is it? Explain the program and its direction. You could sort of roll it up under AIS/ATON. You hear the term used all the time “virtual ATON,” and there are subsets there. Our intention is not to replace a lot of physical ATON’s with AIS ATON or virtual ATON. We have seen some very strategically deployments of electronic ATON, AIS ATON, in the wake of hurricanes to get shipping back open, etc. Right now today, I think, we’ve got just shy of 400 what we call “AIS ATON,” there’s a physical piece, and the physical piece is actually a physical ATON with AIS right there, organic in the ATON. It’s self-contained. Then we have what you call a synthetic ATON. Of those, about 390 are synthetic, so that is a physical ATON, but you could remotely signal the AIS signal from that location. And then I think the one that maybe mariners tend to default to and sort of say, oh, “the sky is falling,” is the virtual ATON where there’s not actually a physical ATON there, you’re just projecting a signal from a remote location. We’ve used that virtual ATON to reconstitute waterways in the aftermath of storms. It is not our goal to use electronic ATON/AIS ATON to drive down the physical inventory. There are some places that might lend itself to that. We’re looking at how to embrace technology to build some resiliency into the system. That’s the real benefit here. In the western rivers we move those AtoNs around. The waters move and the tenders there don’t have an assigned AP – AP is sort of based on the water levels. I’ve operated on the western rivers, spent 5 years of my life working waterways management, commanded a buoy tender, and started out in a buoy tender – I understand that world of work. I don’t think the mariner needs to be overly concerned. We’re trying to strengthen the system, not make their life more challenging. You just put out this Maritime Strategic Outlook document. Within that document, you talk about “facilitating lawful commerce.” The Coast Guard has a safety component, you have a regulatory component, but what does this mean in practice, really? The Commerce Department owns the bucket of work called “commerce,” but when you take commerce to the waterway and you think about where those Coast Guard core functionalities in that space reside, that’s the first line of effort in that Maritime Commerce Strategic Outlook. We put 45,000 federal aids into the system. We’re updating, and the second line of effort is Modernizing Aids to Navigation and Mariner Information Systems. The third line of effort there talks about workforce capacity and partnerships to meet increasingly complex operating environments. The maritime environment has a lot of moving parts. We enable that. Take a look at LNG. It’s an increasingly complex environment. Who would have thought we’d been exporting LNG just 4 or 5 years ago? Now, we may be looking at hundreds of LNG export movements in the next year or two. I’m not staffed to do that today. The Coast Guard has key enabling functions – that’s where we fit into that conversation. This Maritime Commerce Strategic Outlook walks the Coast Guard into that conversation. You ask: does the Commerce Department arguably own Commerce? Yes. I would say the Coast Guard is a key enabler, as a federal agency, to everything that goes on in the Marine Transportation System. What’s the biggest task on your plate right now? If you could accomplish just one thing during your tenure – maybe that’s not the same as the biggest task – what would it be? I’m reluctant to set my goal on one thing six months into a 48-month tour. I want to build on the work of my predecessors. I think we’re on a pretty strong trajectory of recapitalizing older assets. We’re building national security cutters. We awarded a contract in September to start work on the Offshore Patrol Cutter. We are continuing to build Fast Response Cutters. We’re guardedly optimistic about the Polar Security Cutter funding coming in ’19. And we’re talking about the Waterways Commerce Cutter as a program of record and Congress is putting money above the President’s request in there back in ’18, so there’s a lot of interest in replacing those half-century-old-, so that’s five ship classes. Number two, because my number one priority is readiness – readiness today, readiness tomorrow – everything is about readiness. Within that readiness conversation, I’ve coined the term “a mission-ready total workforce.” A new blended retirement system, for all the members of the armed services, will help. Serving 20 years before any kind of defined benefit, I’m not sure that’s a modern model that meets the modern psyche of our great young Americans that want to serve. So I support it. The Coast Guard enjoys, under the previous model, about 40% of our listed work force would go to 20 years, 60 percent of officers. I think that far exceeds any other service. I need to keep those folks in for 20+ years. That’s that apprentice, journeyman, subject matter expert model that allows us to get after that important regulatory work you talked about. I’ve got to invest in that space and make Coast Guard men and women feel like there are opportunities for them to advance, and professionally be successful. We have to support their families with healthcare, including medical care. We’ve got challenges. I’ve got a doc shortage of about 25 to 30 percent. I’m focused on a Coast Guard that looks more like the nation we serve, so diversifying our ranks is important. I would say we’ve got some success stories there and we’ve got some opportunities across the Coast Guard. The proportion of the Coast Guard that’s female is about 15 percent. If I’m only tapping into a third of the available workers in the world, I’m not so sure the Coast Guard can remain a successful organization. The Coast Guard Academy is a subset of that. The cadet corps of 1,100 cadets is now 40 percent women. When those women hit the waterfront and start their Coast Guard careers, I need to understand what it takes to keep them along their male counterparts to have a career. But right now, we see women leaving the service in a little bit higher proportions than men at different key points. The third area is our $1.7 billion of shore infrastructure backlog. In a 12 billion dollar organization, you should recapitalize a couple percent a year on your old infrastructure. We’ve been kicking that can for the last couple decades of my career. We need to figure out how we articulate those needs better to Congress and how we chip away at that problem. We got a little bit of money in some of the hurricane supplementals that have come in recent years. But, I can’t tackle that just in supplementals because we’ve got hurricanes – we need some steady increment of funding every year. We need to maintain momentum, capitalization, and recapitalization, develop the mission-ready workforce, broaden our diversity, and get after some of our capital backlog. I put some guiding principles out on Day One when I talked about the Three Rs – a Ready, Relevant, and Responsive Coast Guard. And this all rolls up into that conversation. So that’s what I’d like to leave you with. I think it sounds fairly simplistic, when you look at the objectives under there and the sub-activities; we’re not going to be able to tackle all of that in the annual budget cycle. But we’re gong to be purpose-driven, we will connect the work of the Coast Guard at the pointy end up in Valdez, Alaska, with this headquarters to make sure we’re supporting our men and women that are doing the mission.